This is a very big first for this blog and I, we have our first request for a post. 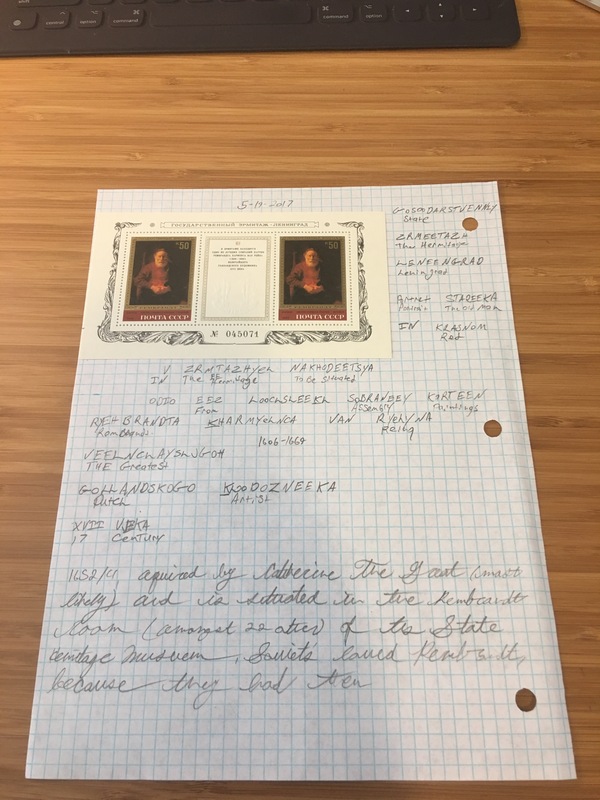 A reader asked if I would tell how I became involved in stamp collecting. I thought that was a very fine question, as it allowed me to talk about one of my favorite subjects…me. Just kidding, I love to talk stamps. First off, what is a stamp? Well, as best as I can put it, a stamp is something which marks the monetary requirement of something as having been met. It means to us, something with which to send mail, and can be used to ensure that a tax on some commodity has been paid. If you are, or know a smoker, look at a pack of cigarettes. If the bottom portion of the cellophane is still there, most likely you will find a tax stamp present. Fortunately for our lungs, our subject at hand is postage stamps. There was a time when you could send mail without the use of a stamp, but the recipient would have to pay to receive it. This was terrible. It was the collect call of the day except that should the recipient refuse to collect their mail for any reason, then the service had already made the effort of physically moving the mailed object. The London Penny Post of 1680, moving mail around London eliminated the basic flaw, collect the money before hand, and prove that it was done by physically stamping the piece of mail. Voila! I will not make a huge history of stamps here, after all this is about my history with them. I am from a town call Soddy-Daisy, Tennessee. The current post office was erected there in 1983. My grandmother went to work there in 1985. My grandfather worked there as well, I cannot tell you when he started at this moment. Sometimes, my mother was even a sub when there was a need. I remember a good deal of time spent in the back of that post office due to the fact that they all had to work, and I had to go somewhere. I could walk in today and find my way around…well up until I was arrested for trespassing as almost no one there knows me anymore. I was recognized when I went to mail something there during my recent road trip, but that happens less and less, and it is a bit perturbing considering the connection I feel with the place. There is a retaining wall in the back parking lot with train tracks at the top. I remember seeing tanks being moved by train there, and my grandmother told me they were going to the war (Desert Storm if it was true). I have many memories of playing out there if she needed to go finish work after picking us up from school. It is a rural place and to me, that post office had a yard. I truly love it. We kids were always being taken to post office picnics, helping at the post office booth at the county fair, wearing post office (and more importantly Stamp) shirts. It was a part of life. So for me, stamp collecting was kind of Organic. My grandparents would show me stamps, and by my nature the minute I found out that a thing could be collected, I collected it. Now, at this time this might have consisted of a bunch of cancelled postage in a bag in my room, haphazardly glued to the pages of something. Nothing of this early collection remains. Stage two came in fifth grade. We had been on a class trip to the Coca-Cola bottling plant, and we were asked to write an essay about it, and the next day a winner would be picked, six pack of Coke as a prize. I won! I was kind of shocked, but I mean I had wanted to be a writer, and now I had won something for writing. 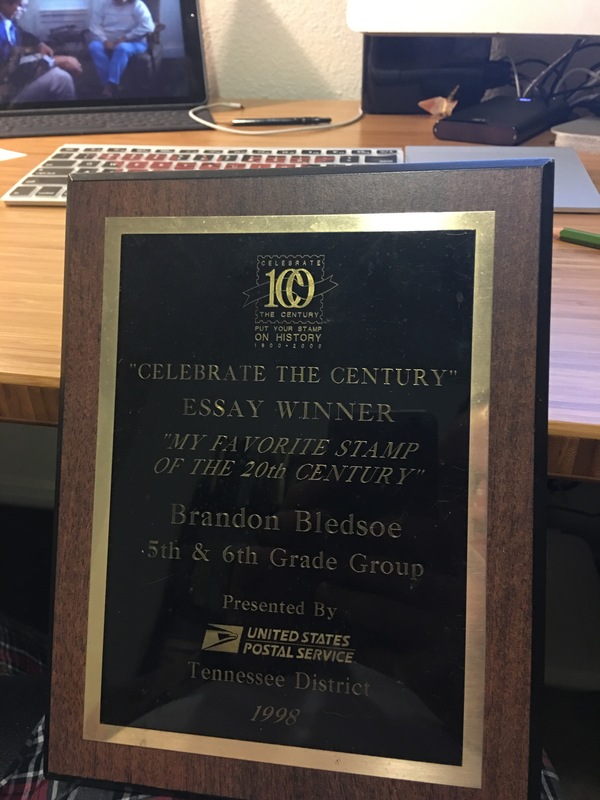 My family was told, and my grandmother told me there was an essay contest for the “Celebrate the (20th) Century,” stamp campaign going on at the time. I really loved the Celebrate the Century stuff because it was all very in your face and wow stamps are cool. I wrote about my favorite set (only set) which was the Classic Movie Monsters. They are awesome. You could buy this little plastic card that revealed hidden images in them, like bats behind Dracula. I had that thing…need to see if I can get one off of EBay. Much to my shock, I won that to (for my state. )This was huge for me! I had won two things for writing. The prizes were not to be sniffed at either, I was buried under stamp stuff. I still have exactly one item from it besides the plaque. I have the 1997 stamp collection. More about those later. The news came and did a thing about it, at the post office. I have a picture of that somewhere, and I wore a stamp tie (Looney Toons) and they gave me 150$. I used that to by a nice new Sanyo TV. After this, everyone just kind of knew I was a stamp collector. 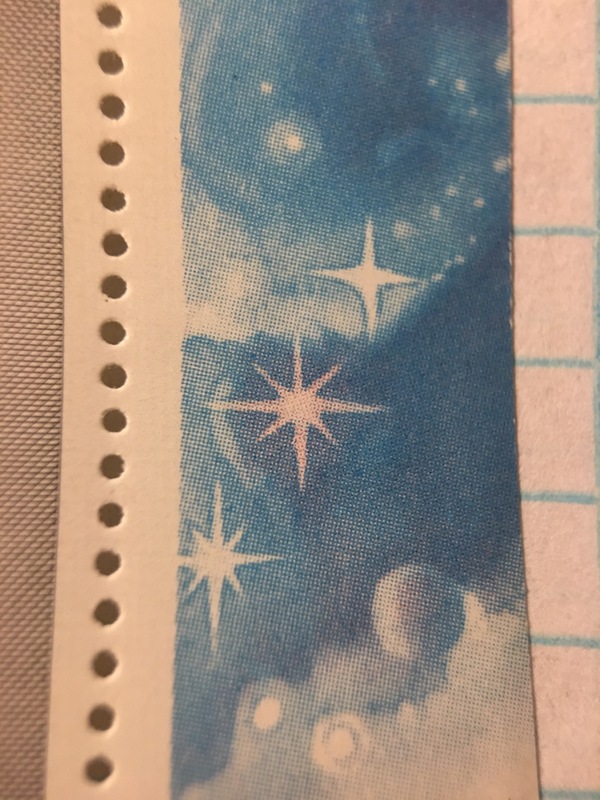 I think if not for my great aunt and my grandmother, I really would have been known for being one without being much of one, but they would buy sheets of stamps they knew I would like and give them to me for my birthday and such or just because. I think my favorites so far are when my great aunt surprised me with the Lucille Ball stamps (I really do love Lucy,) and my grandmother ensuring I had a set of the Harry Potter stamps (ok. So this still goes on. I had a kid already when those Harry Potter ones came out.). Around eighteen, I joined the army, and I reconnected with my love of the mail. I do not know how basic training is now, but when I went, it was like the movies, you got very few phone calls, and you wrote letters home. I certainly did. I am very glad that our drill sergeants did not always like us to pay for each piece with pushups. In a training environment, a drill sergeant distributes the mail, which they have to go and get from somewhere secure. When we would get back late, I think often times they were just hoping that we were too tired to care, and they hated me because I would ask in front of everybody (sometimes I was discouraged from this) “Drill Sergeant! Is it too late to ask for mail drill sergeant? !” They did not have to go get it, but usually they did. After a while they made me go get it and bring it. Then it became my task to gather up everyone’s outgoing mail and take it to the mailbox in the morning. Fast forward two year. Baghdad Iraq. I wrote letters still. I did not need to. We had computers with email a good bit of the time, but I really liked mail. Every team had to have a guy who could pick up the mail, usually someone in charge. I would always get mad because they never went to get it, and then I would pester the mail room sergeant about it and he would go on and on about “being certified!” Finally I asked him how to become certified and he asked for my ID card and my assurance that whoever was in charge of it wanted it. I gave both (I had an ID and I was not actually clear on who was supposed to be getting our mail.). He bent down, wrote my name and unit in a book, gave my card back and said “ok.” I thought, “wow. That was easy. So easy as to almost be arbitrary….”. I signed a book and wheeled our mail back. No one really ever asked why I started showing up with it everyday. Back to the stamps. I came home and ignored my hobby for sometime. I ignored many things. 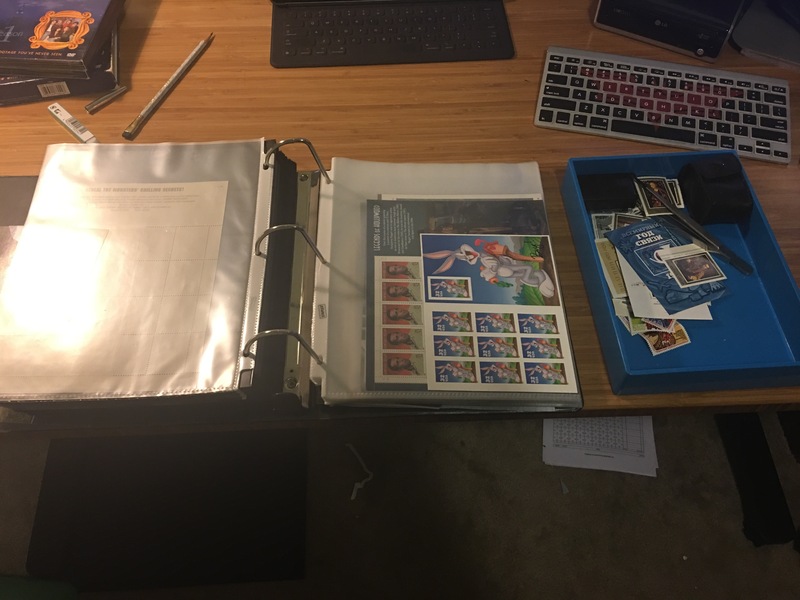 Later, after I was out of the army, and my first son had been born, I realized that without ever noticing, I had been buying stamps and putting them in a binder by the sheet. Just because, that was my thing. I was collecting again and had resumed it without ever noticing. I had some catching up to do though. So I took to eBay for that. Now, whenever stamps come out that I like, I buy two sheets. One for me to use (as I write a lot of letters) and one for the book. I tried two for the book (one for each son) but that got pricey in a hurry. One for the book it is. I love going to the post office to get stamps (Fort Sam Houston, clean it up, the stamp situation here gets sad,) and to see L. L is the clerk here, and he is amazing, and almost singly responsible for me discovering a love of Jazz. He is everything you want in a postal employee, he makes you feel like you are family and you matter. Today my son got involved. Well, he has been but until today, he just liked to put the paper that old stamps come on by the bag into hot water and remove and dry them. Today we collected, and I am indicating that we did it together on the label of each one. Let’s talk about the why. I do not know why it started, maybe just a way to get a second use out of something back when. Some people collect for the sheer love of stamps (woohoo!). 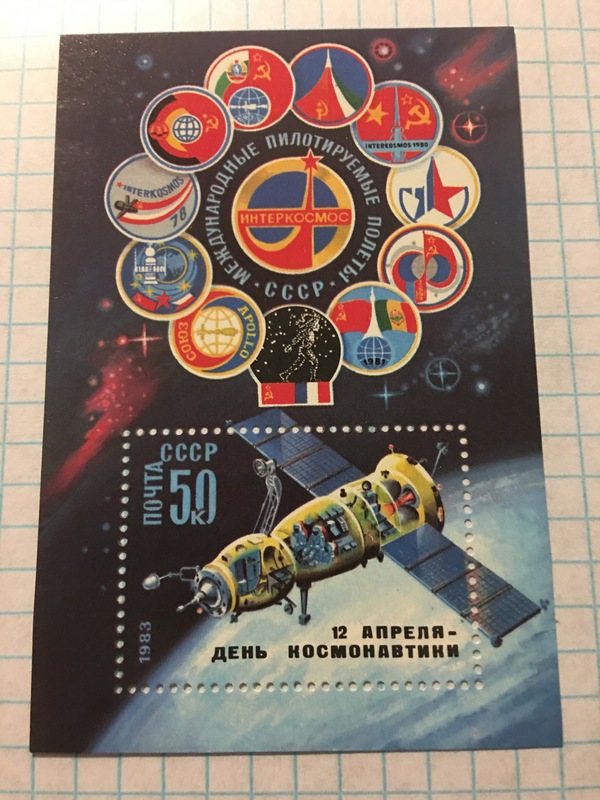 Some collect because stamps are national symbols, little posters of history (double woohoo!) some collect for profit (every community has them.). I took my son to the National Postal Museum (go! I will write about it later) and it was awesome. That is as close as I care to come to valuable stamps. I collect because I love stamps. I collect because things I love are on stamps, the collection is a form of expression about the collector (see photos.) Now I collect to express a love of history. 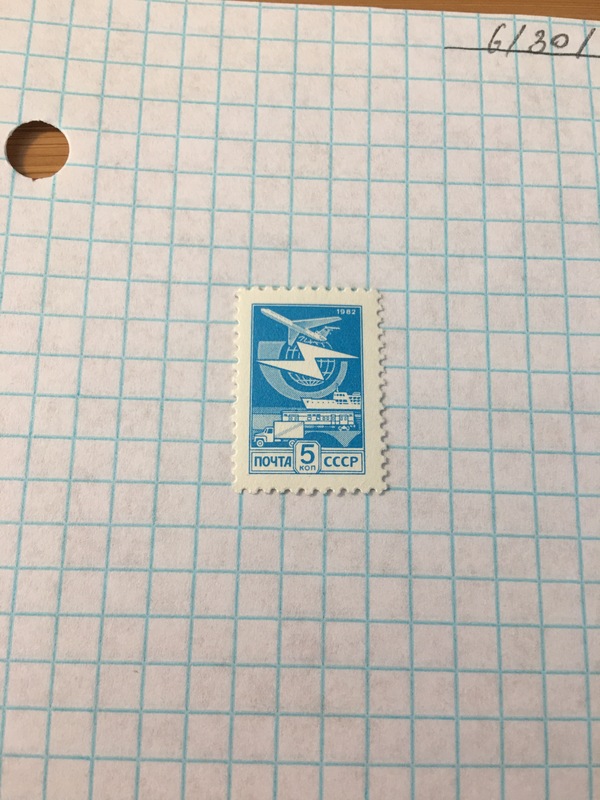 I major in history and I collect stamps of the Soviet Union because it allows me to learn, and to be amazed by the art that these people produced. They are beautiful pieces of history. Now my son collects with me. I collect for love. Whatever your reason, make sure you love it. You should feel something when you are with them. Now, here is my primer on how. Ask yourself why you want to collect stamps. Do you just wish to amass stamps and Scrooge McDuck swim in them? Cool! Do you like the ones being put out in your lifetime? Do you want the presidents? Are you looking for stamps about something dear to you? 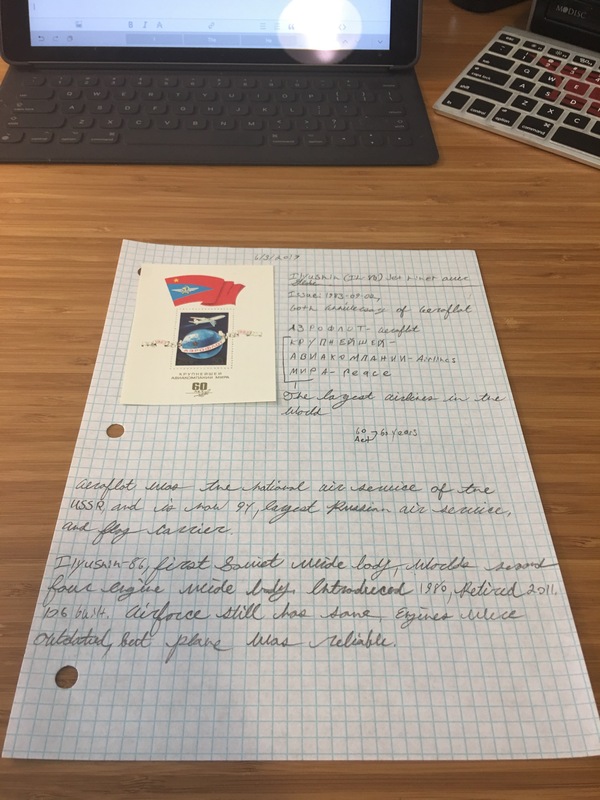 Do you write letters and have realized that the ones from other countries are fun? Understand what started to pull you in and that will tell you where to start. You can find proper supplies on Amazon. 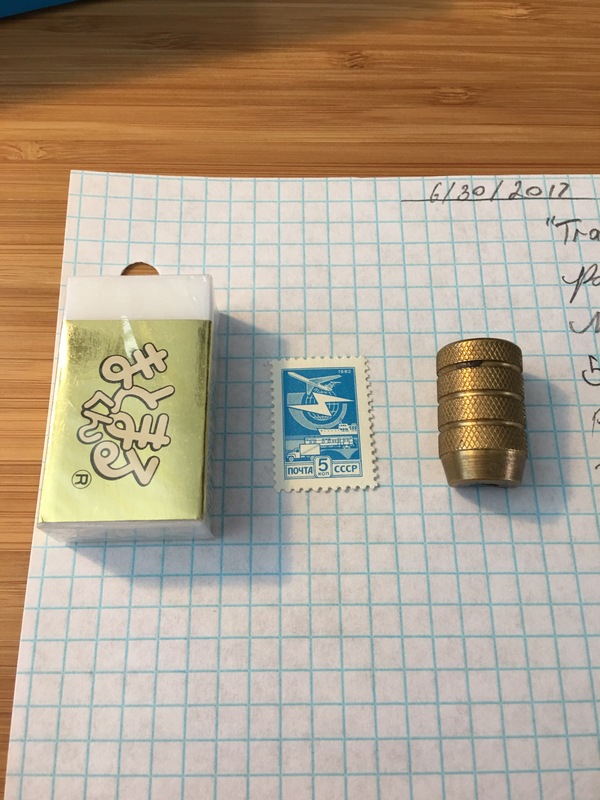 Search stamp collecting supplies, get a binder, a magnifier ( to check out the details!) and some decent quality stamp sheets. I like the Light House Vario brand. You can buy books if you like, they are helpful guides. If you are collecting sheets of current stamps as they come out, a book will not be necessary. 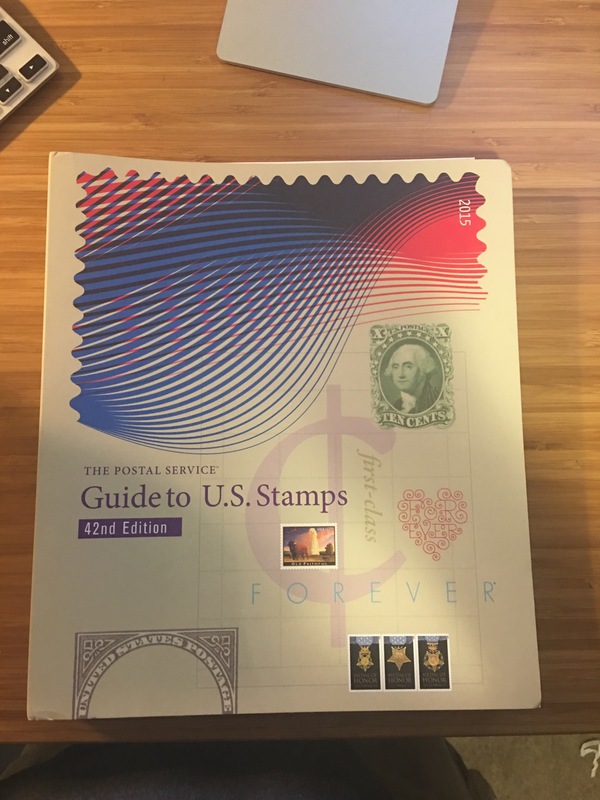 If you are collecting older stamps, every year the post office puts out a stamp guide that has every U.S. stamp up to the printing of that book. I recommend it for dating stamps and such. If you plan to lift the stamps off your mail, be prepared to be frustrated. The self adhesive ones are the bane of every collector I know. They do not come off the same way as the others (hot water) and the only way I know to get them off is with a citrus cleaning spray that ruins the whole thing for me (very smelly) so I do not try. If you want older stamps, especially without a theme, go to places like hobby lobby. They sell stamps by the bag. You will get tons of repeats ( I trade mine or give them away) and you get to have fun looking through them. There is killer variety too. I get plenty of WWII war bond stamps there. The USPS is a great way to collect. They put out a stamp collection every year (like the one I showed above) that has information and a copy of every stamp made that year. This is an investment, but you get them all, and no research, and you still stick them in their places in the book, so you are hands on. The also just sell every stamp that year as a bagged set, so collect how you want. I prefer sheets myself, but the set can be more cost effective, because then you only have one of each rather than the 10 or however many on a sheet. That is my stamp collecting story, and I hope you enjoy it. 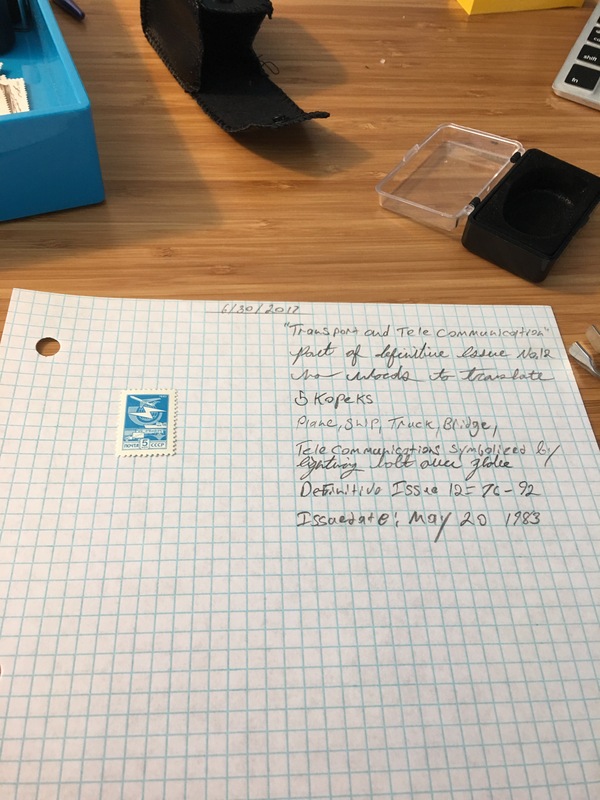 I truly love this hobby, and I have far more stamps than I actually use on mail, and that is saying something. However, I firmly believe that time spent on an unharmful passion is time well spent, and I will never regret my son asking me if we can do more stamps. 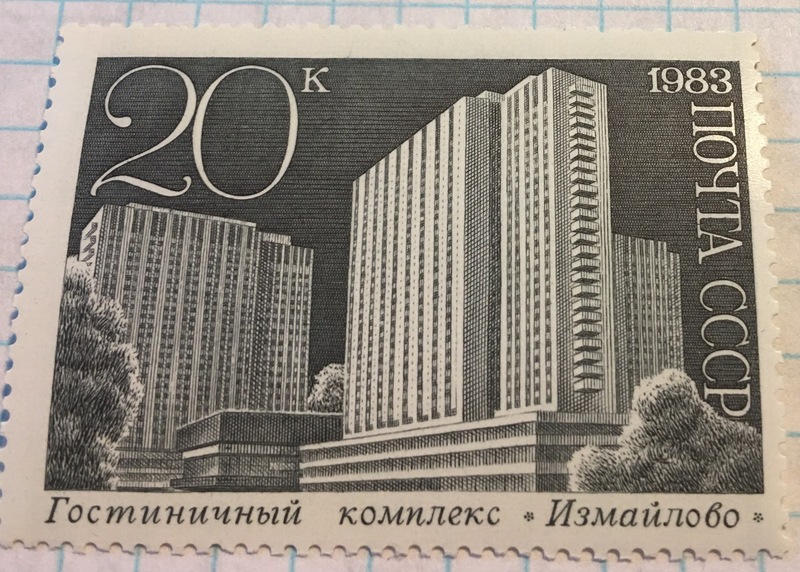 These stamps here are perfect examples of Soviet stamps being meant to be sent and seen outside of the Union. 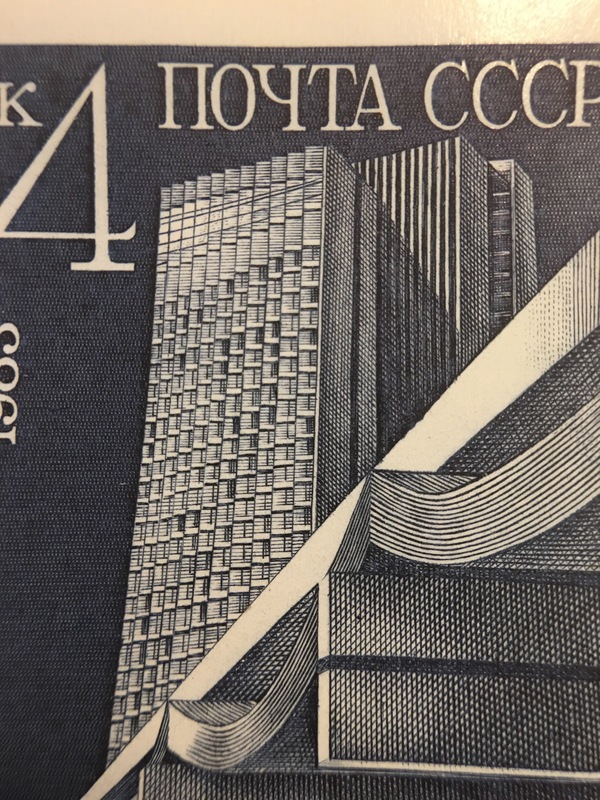 These are architecture projects in Moscow, that to me smack of modernness, and more importantly exhibiting what they had done for the olympics three years prior. The entire series was issued on December 15, 1983. This are the first ones I have catalogued and written about that are printed in relief. The basic idea is that the image is etched out of the plate and when the object is printed, the ink fills in the spaces that were etched out. 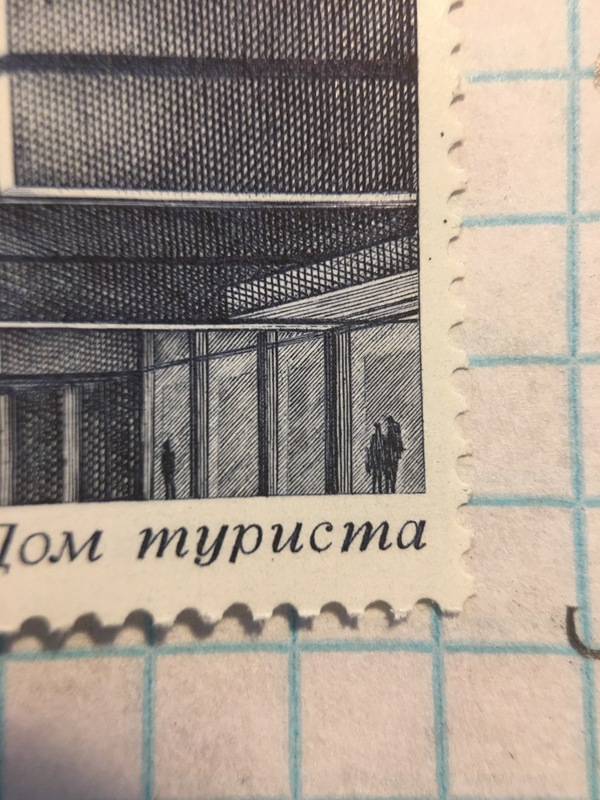 It makes for incredibly beautiful and detailed stamps. They are some of my favorites, and I often have to fight the urge to touch them to feel the printing. At the end there will be more photos. This is the Natalya Sats Musical theater, formally known as Moscow State Academic Children’s Music Theater Named After Natalya Sats. All infomation cited as (Wikipedia) can be found here. 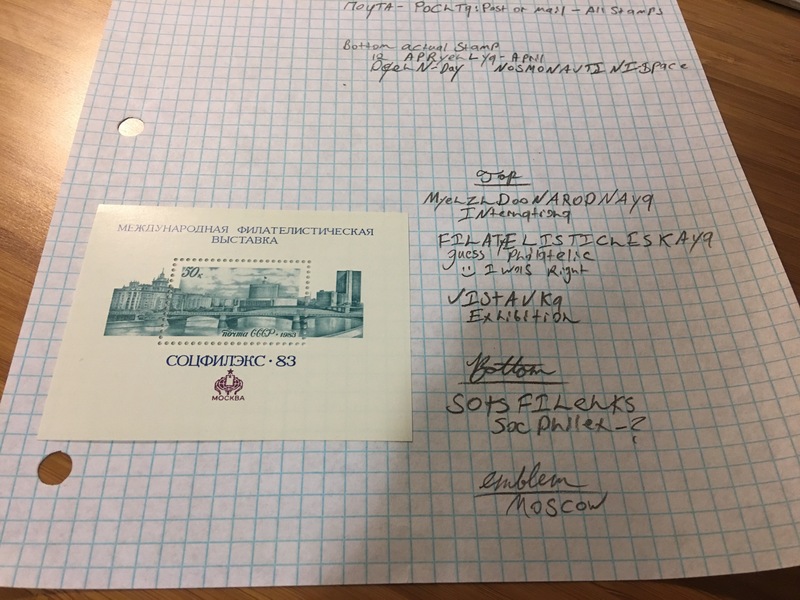 Details: Issued 12-15-1983, face value 3 Kopeks-it would have sent a postcard. Natalya Sats was the director of this institution in 1921, long before this building was opened in 1979. Sats and her institution were part of Lenin’s wife wanting children’s art education to resume. Sats had a break in her directorship due to the purges, but resumed until she died in 1993 at the age of 90. (Wikipedia). It is very interesting, and if you have time you should read more about this fascinating institution for children. The hotel is now called the Astras, and it is still in use today. Thirty-three floors, 537 rooms, opened 1980. What I find interesting is the tiny silohouettes of people in the windows, all the way down the hotel. Value: 6 Kopeks, post card, domestic letter, small registered item. I believe registered to cover international as well. As of 1981 this was the seat of Soviet government, and it is still in use for that purpose today. It is listed as the Russian White House, it reads to me more similarly to 10 Downing Street in London, home of the government and Prime Minister. It replaced the Grand Kremlin Palace, which to me is funny. 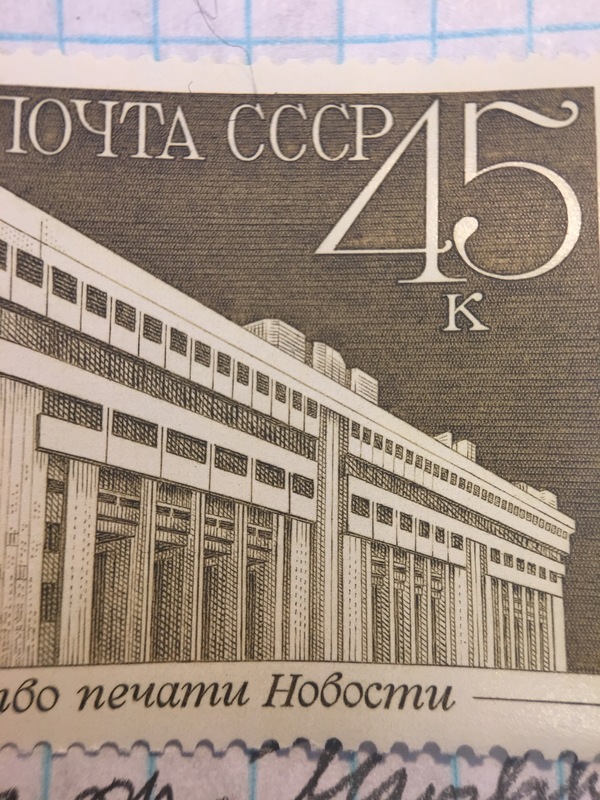 It would seem that Bolsheviks would have wanted something clean and modern, unassociated with the czars and aristocracy, so this coming so very close to the end of the Soviet Union surprises me. Of course, they did not know it was going to end in a decade. I love this one. Just look at it. It makes stamps today look cheap by comparison. Value: 20 Kopeks, Postcard, but in five kopeks it will be more than a post card ever was, domestic letter, registered item. Opened in 1979, this is actually a hotel complex consisting of four separate hotels. It was built, in keeping with the theme, because there were not enough hotel rooms for the coming olympics in 1980, that were to be hosted in 1980. These are still in operation today, ranging from 3-4 stars. Interestingly this was the world’s largest hotel until 1993, when another was opened in Moscow. It was beaten by the expansion of the MGM Grand in Vegas (Wikipedia). This one, I admit, gave me some issues. I had a hard time with the fact that the words in this case are printed in cursive. 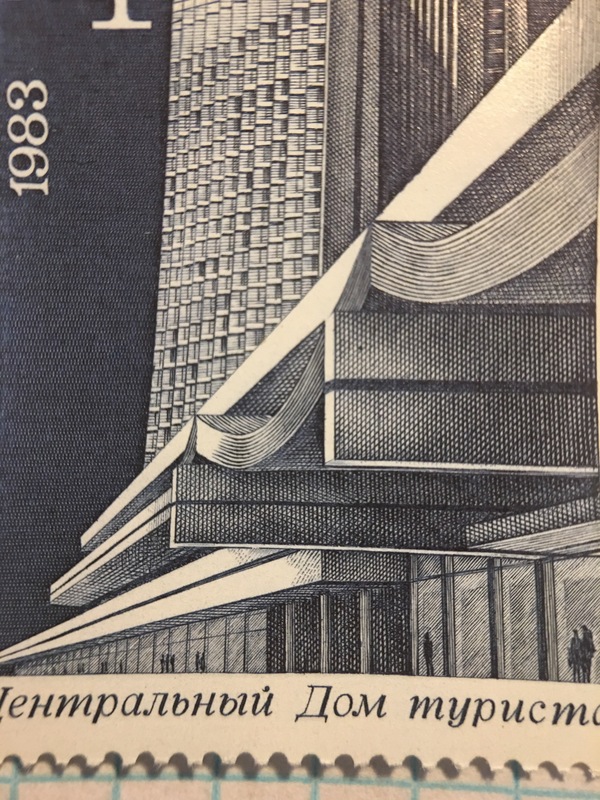 I turned to soviet-postcards.com, and it just came back as “News Publishing Agency.” I looked at buildings added to Moscow in the time frame, and found the part about it being for the olympics. Value: 45 Kopeks, this would only have been used to send a registered item, and I speculate internationally. 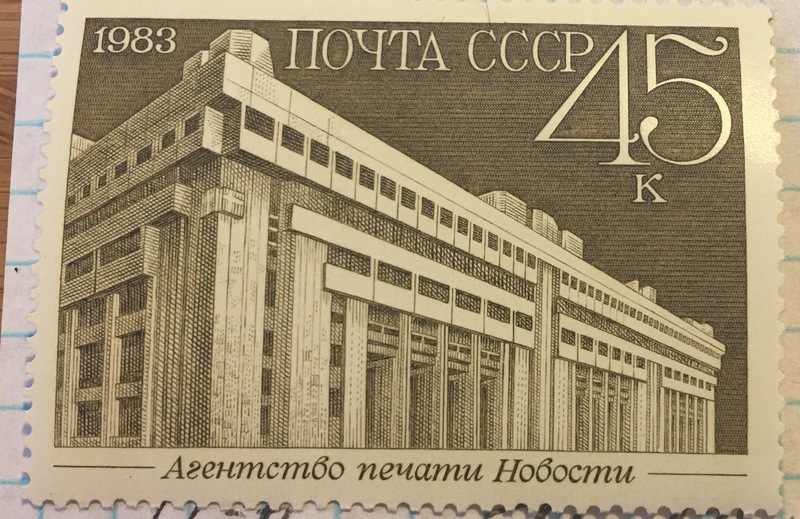 Stamps were meant to show off to the world, and historaical rates say that no domestic letter needed more than 40 Kopeks. Registered was between 6 Kopeks and 1 Ruble (100 kopeks to the ruble). I figure this to be where all the press conferences, maybe the ceremonies and such were held for the olympics in 1980. Now it is simply noted as being used as office space. That is a step up from all the abandoned spaces created for the Olympics. Details of the 1980 Summer Olympics taken from here. Do not forget to cite, like I just did, albeit in a loose format. The Olympic Games of 1980, would be the smallest since 1956, due to a boycott. The boycott in 1980 was over the Soviet Union’s invasion of Afghanistan. However, these games would still be noteable as the first and only to be held in Eastern Europe to date, and they were the first to be held in a Socialist nation until, remaining the only one until 2008, Beijing China. The full details can be found above, in the link. 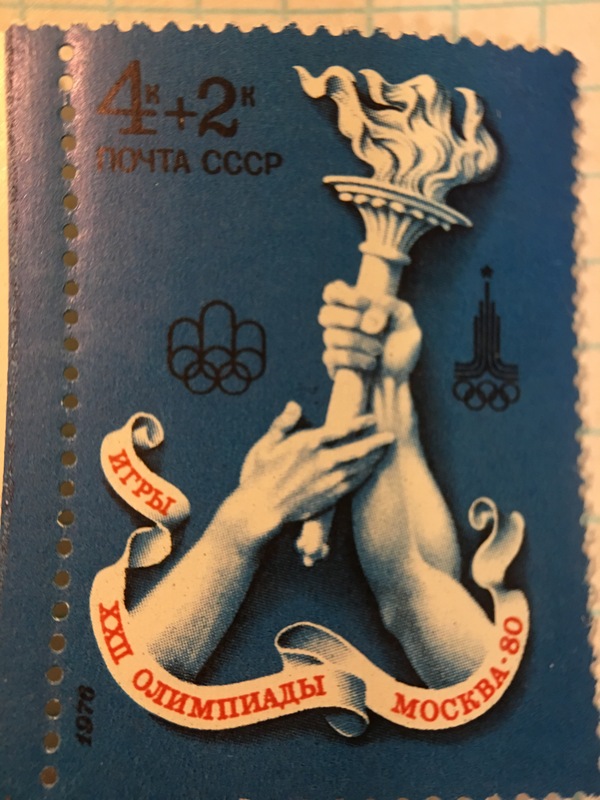 The 1956 games were also boycotted over the Soviet Union. 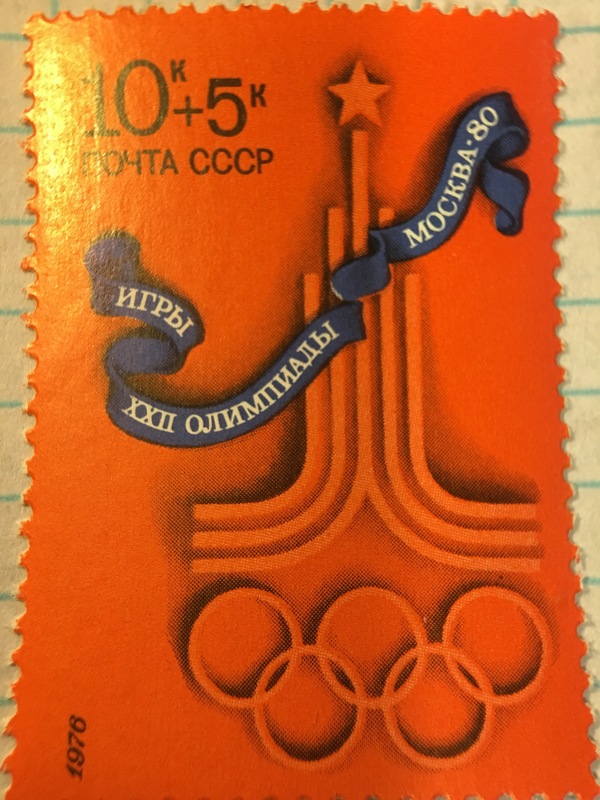 It is also worth noting that only Moscow, and Los Angeles competed to host in 1980. 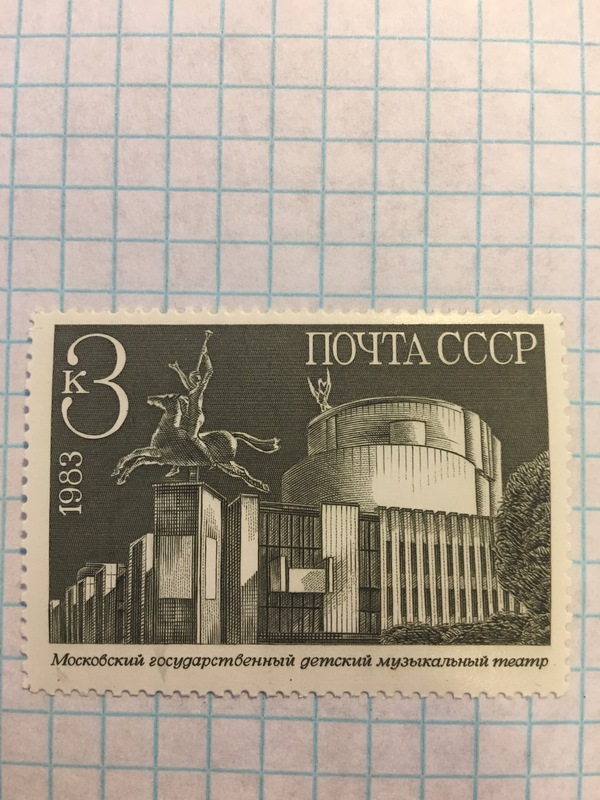 It needs to be understood that the Soviet Union did not produce postage stamps solely for their own citizens usage and collecting. They intended these stamps to be seen abroad. 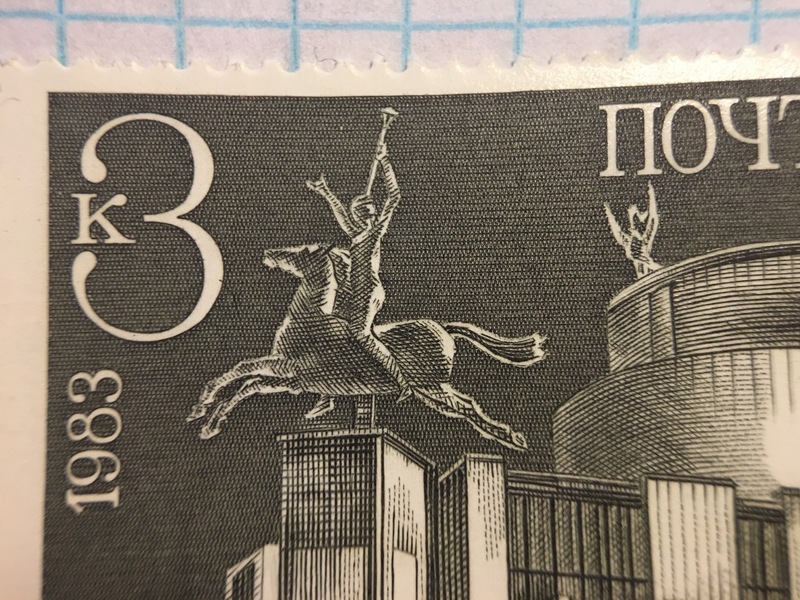 They were using their stamps to show off the symbols, ideas, progress, and accomplishments of the Soviet Union, so it should be, I argue, a neccissity to look at Soviet Stamps as best as one can like a Soviet, but also like an outsider viewing a piece of propaganda. These stamps do have two face values, and that is because they are charity stamps. 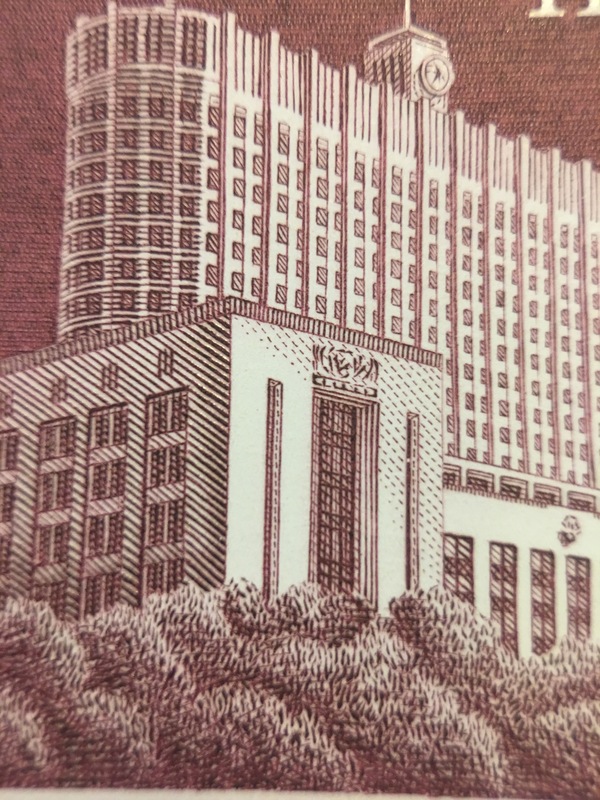 The first value, here the 60 kopeks, is postage, and the second, 30 kopeks, goes to charity. We can’t know what the charity was, but I will check other stamps and if it only occurs with themes, we may make educated guesses. 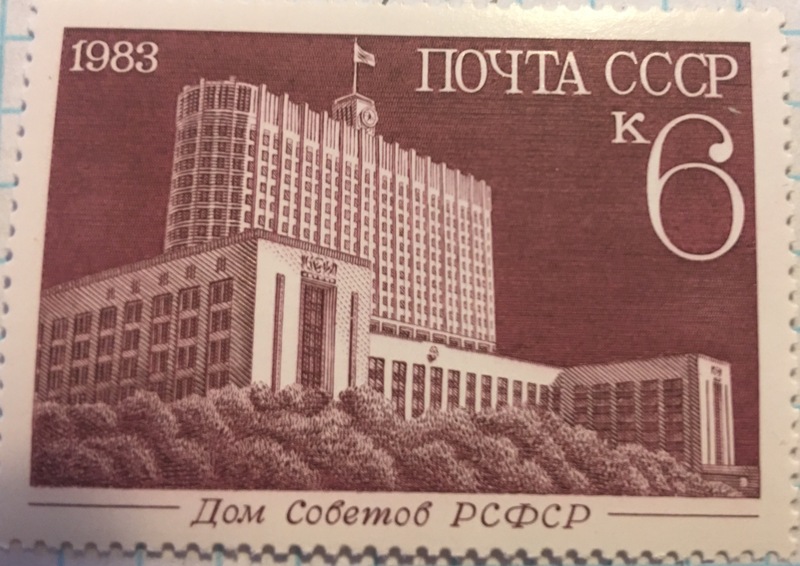 I would like to thank http://soviet-postcards.com for the information about charity stamps. I love this piece. It is a collector’s plate, with a miniature of Moscow featured. 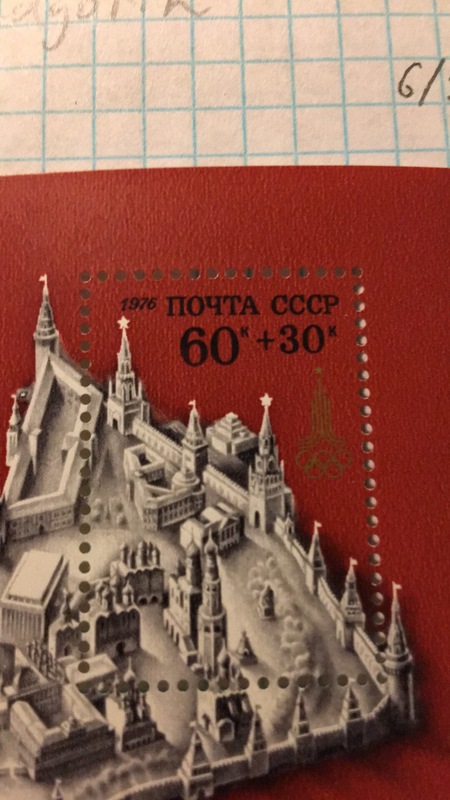 The stamp itself, if used, features mainly the cathedral ( lower left) and the Kremlin Senate Palace ( upper right.). 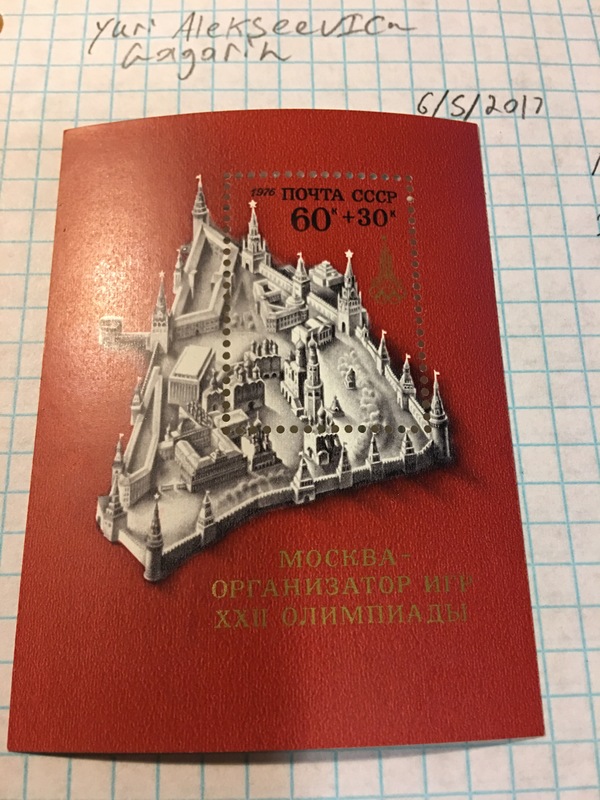 The actual Kremlin is almost entirely on the collector’s portion, not the postage portion. I find this piece, especially considering that it would have been a waster of money to mail something domestic with this, to be fascinating. 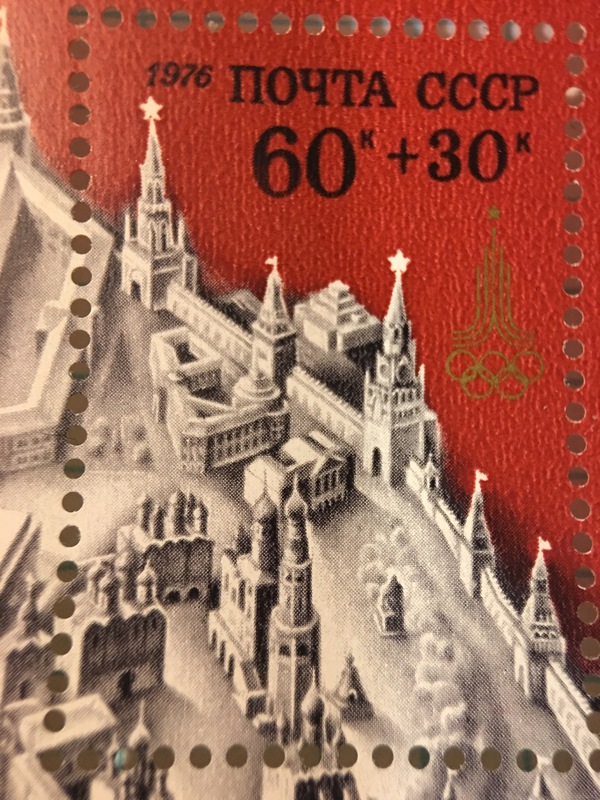 The stamp was highlighting Moscow, but not the Kremlin, if it was used. The other three are nice, but not nearly as fascinating for me. 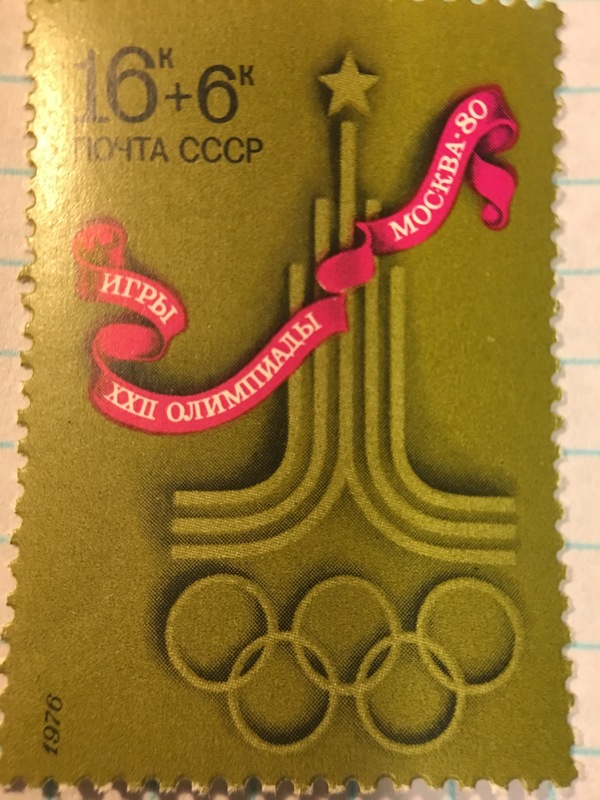 They are various Olympic symbols, with banners which read, “Games 22nd Olympiad, Moscow, 80.” Their values can be seen in photo. I do like that, as each host city has its own icon for the games, the Moscow Icon was similar to the Soviet Star being placed upon a building. On 12 April, 1961, Yuri Gagarin did something that was beyond the scope of words to describe the magnitude properly. 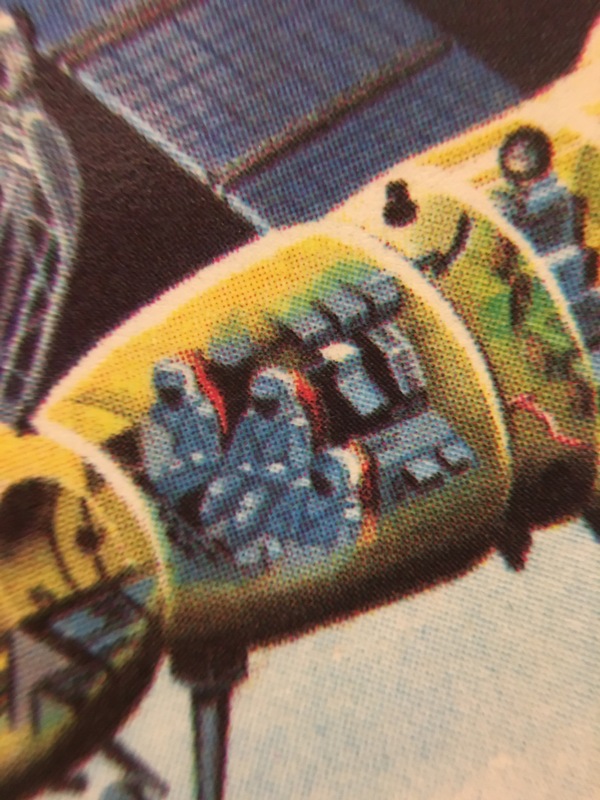 He had become the first human being to fly in space in his Vostok spacecraft. 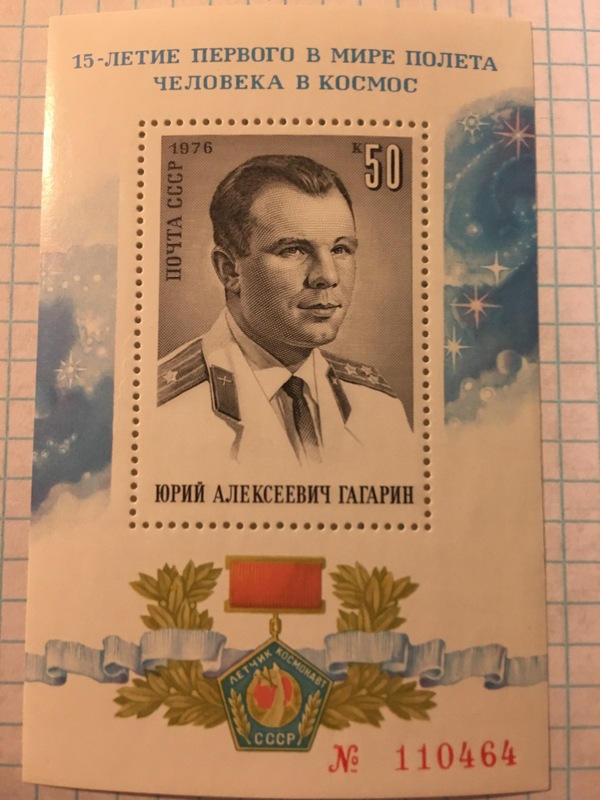 This stamp, which came out after Gagarin had died, was made to commemorate that monumentous occasion. The top text is the title. 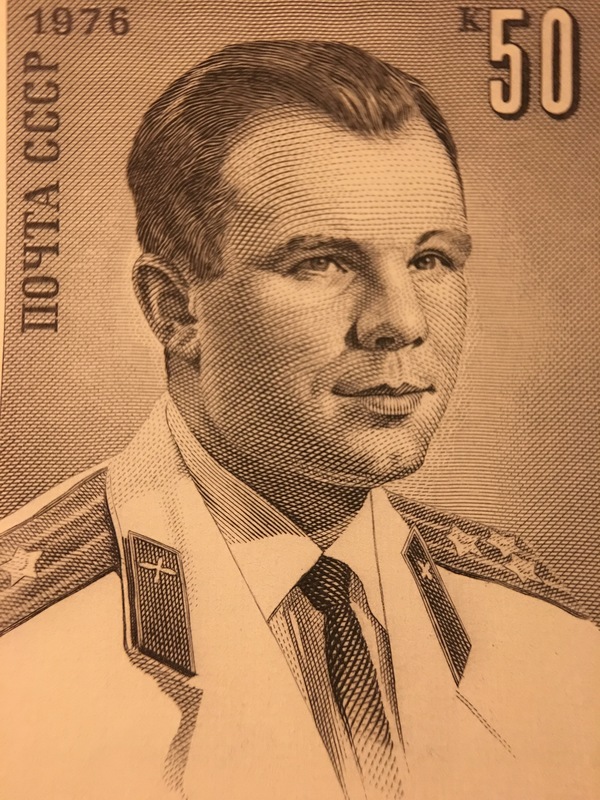 The text under the portrait is his name, Yuri Alekseevich Gagarin. 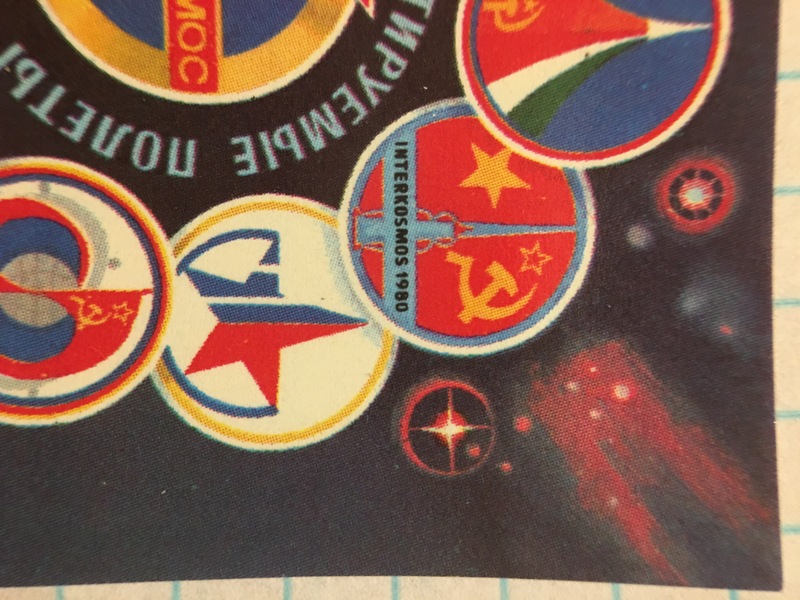 The text on the medal translates as Pilot Cosmonaut, and I believe the medal to be Hero of the Soviet Union. 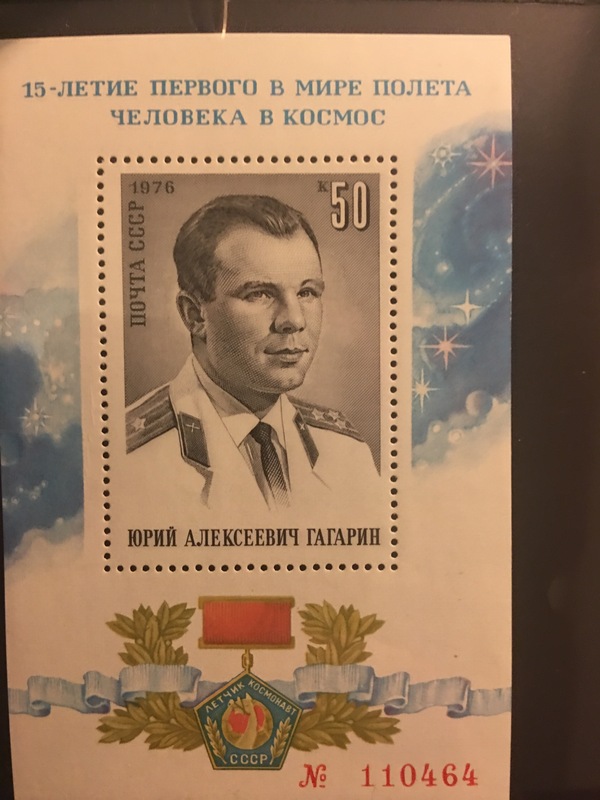 Gagarin is seen here wearing the rank of “Polkovnik” or what the United States calls a colonel. The Piece has a face value of 50 Kopeks. These are numbered, mine being 110,464 of 450,000. Gagarin would die in 1968 piloting as MiG-15. As I understand it his two daughters are alive and doing very well, both very prominent in Moscow. With the Cold War over, we can stop and give Gagarin’s contribution to humanity the respect it deserves. He was the first representative of this species in space. This year marks the 56th anniversary of Colonel Gagarin’s 1 hour 48 minute trip. Gagarin also oribited the earth during this trip. 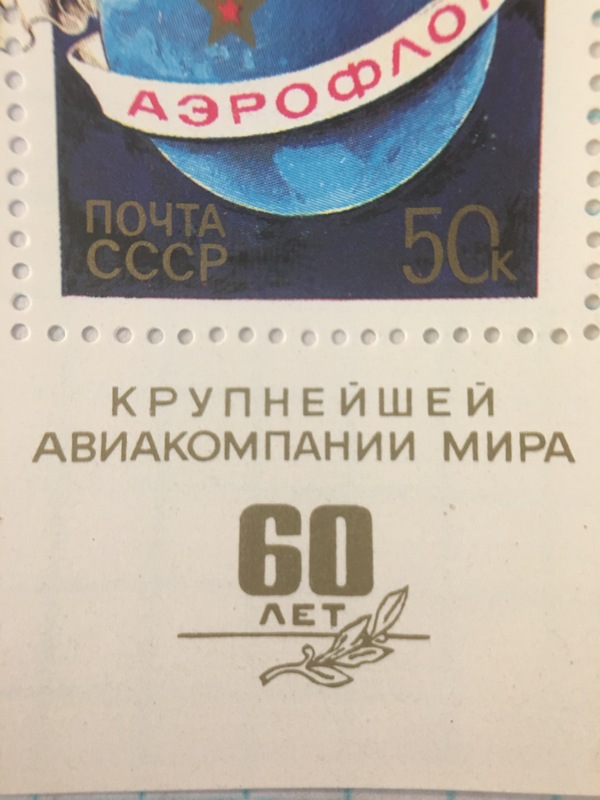 When I started writing this guide to the postage of the Soviet Union, I was still a new collector, but I had a whole year catalogued already. I had the idea to write a blog/guide later. Really the two are linked, as there was no such guide when I started. There still is not now. There is a rather expensive book, which I should probably get around to buying, which tells the names and some basic collectors information, but still this is the age of the free internet. This information should be readily available. So that is what I am trying to do, to share knowledge and information with at least a dozen people. I catalogued 1976 first, I will be going back to write about these while I do 1983. It will get me all caught up and it will help to keep new content being produced by me. All of these can be found on the Wikipedia page for 1976, and more. This list was cherry picked by me from the larger one. It is to be your jumping off point or refresher for this year (and decade as I am starting here) so that you can put yourself into this decade and thinks critically about it. 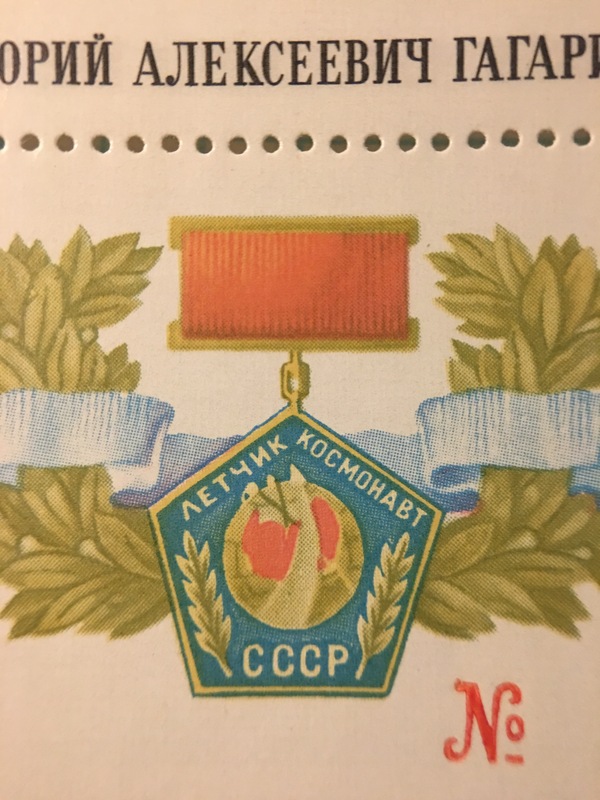 Reading about these events, listening to the music, will begin to give you a grasp of the worlds state, if you want it, so that you will perhaps better understand the stamps the Soviet Union was producing. 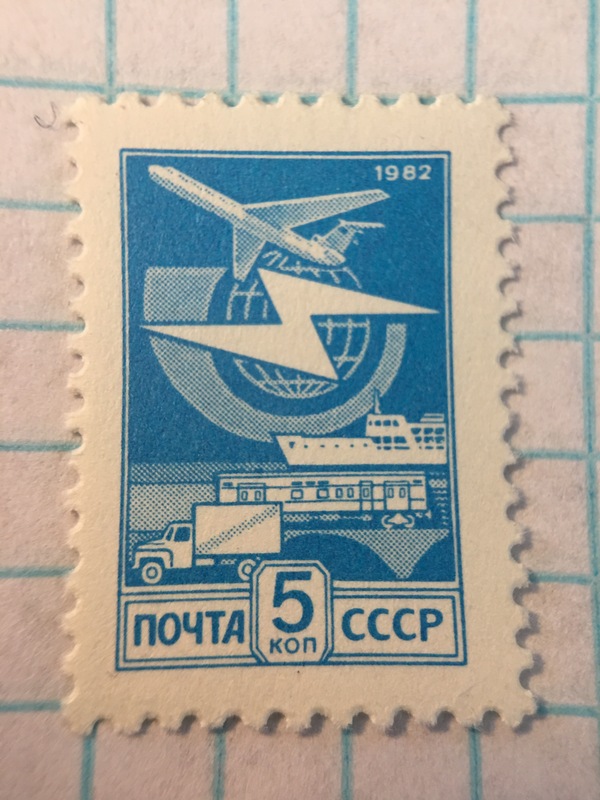 This stamp is most likely titled “Transport and Telecommunication.” It was issued May 20th 1983. 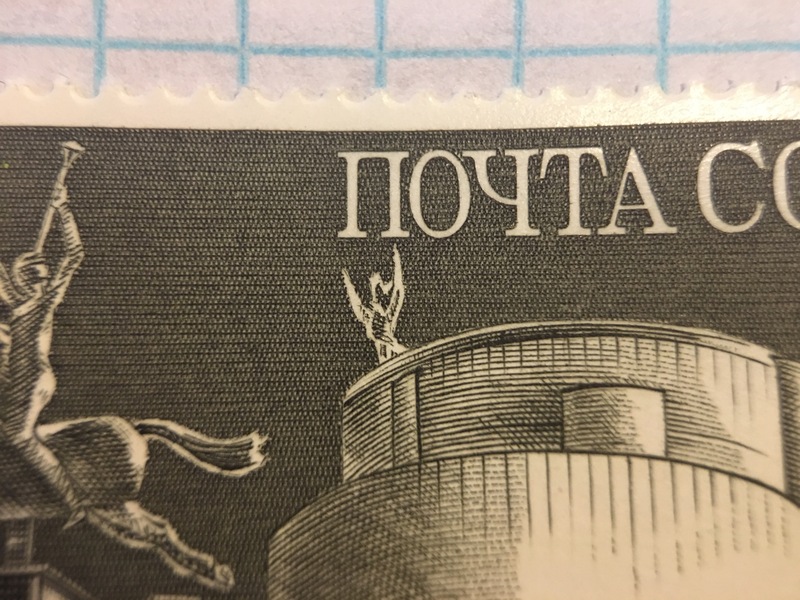 There is not any text to translate, remembering that почта means is the word for “post” or “mail” and can be found on every stamp. 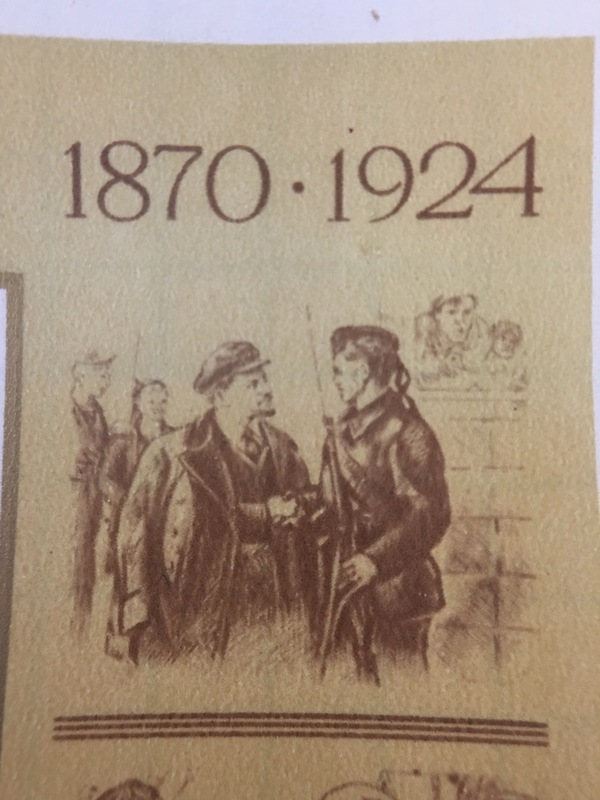 It is a part of the 12th definitive issue, which ran from 1976-1992. Definitive issues are kind of an odd thing that should be addressed now. They were supposed to be the pride of the Soviet Post, representing the proud symbols of the Soviet Union. 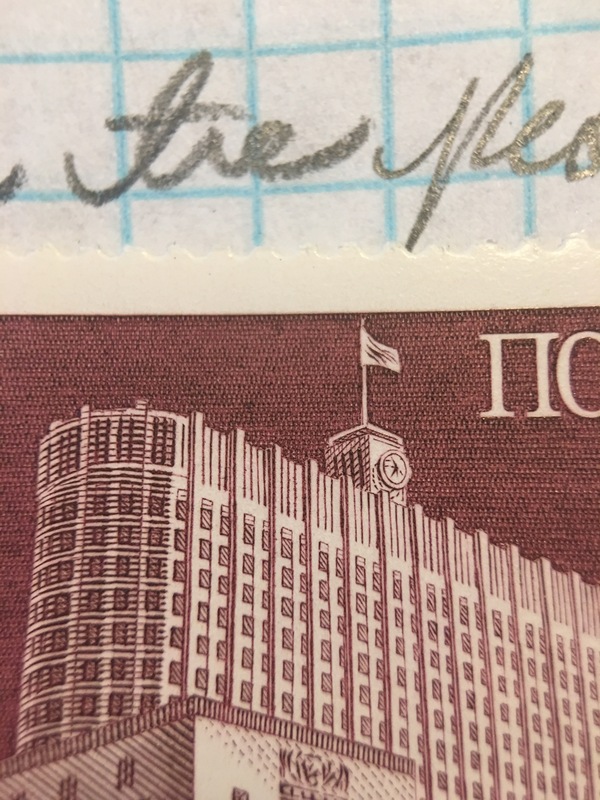 The part that makes them odd is that the stamps stretch across multiple years. 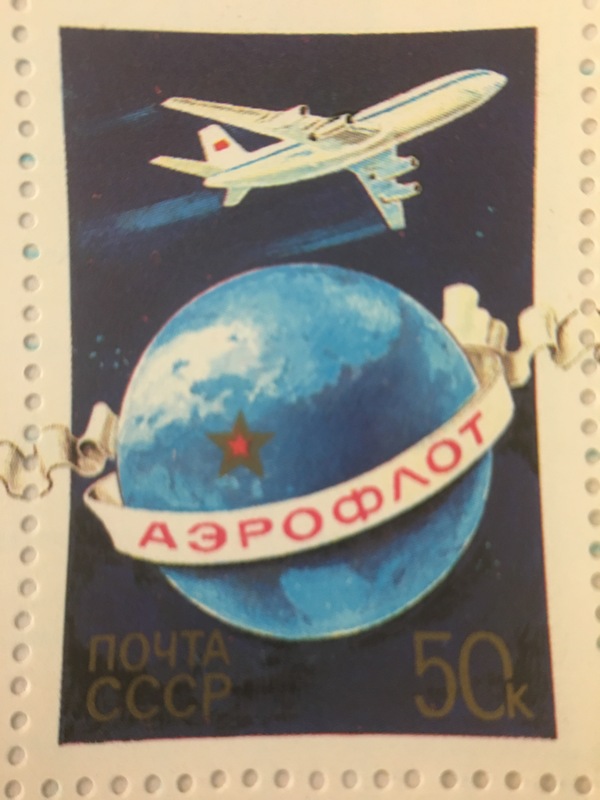 This stamp certainly fits the theme of globalization with these symbols, the passenger jet liner, the ship, and the bolt for electricity being over the globe. It has a face value of 5 kopeks, and is part of the 1983 series despite the 1982 in the top corner, which I cannot explain. It may be listed wrong on colnect.com, or it could have been delayed in being issued due to being part of a definitive issue. 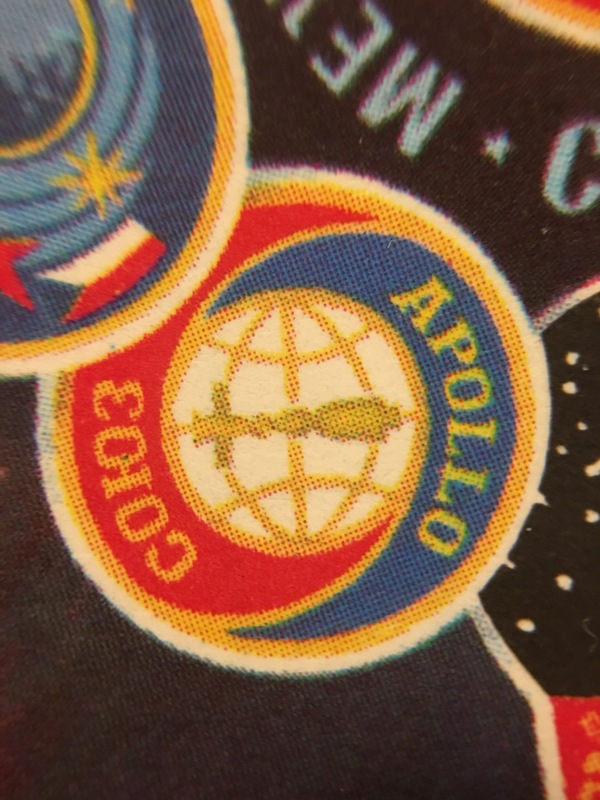 The other notable feature is that the stamp is tiny. I put it next to several objects, not having any coins handy, to give a scale. 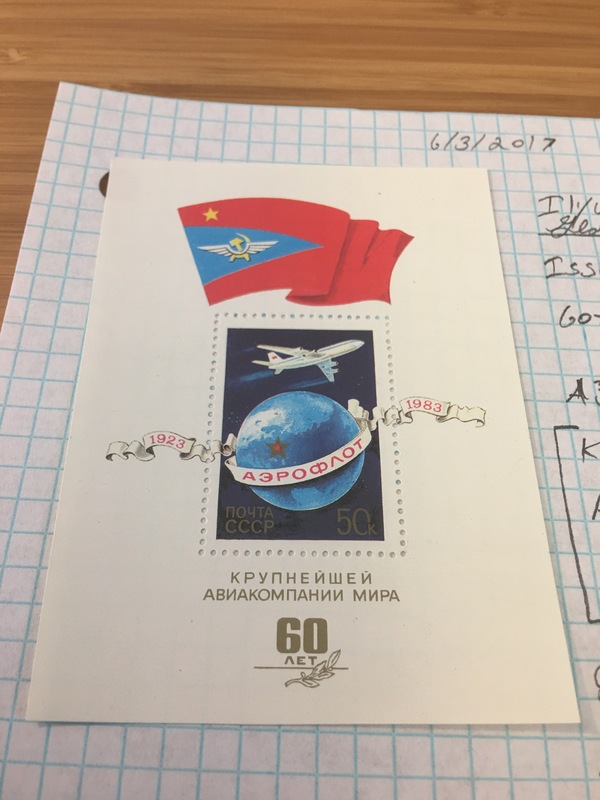 We are back with some more postage stamps from the Soviet Union. The year is still 1983 (and at the rate I work, will be for a while.) Some stamps will be more interesting that others, some I will do in large groups just to get them out, others may be here by themselves. The Savage has four stamps for you to read about today. 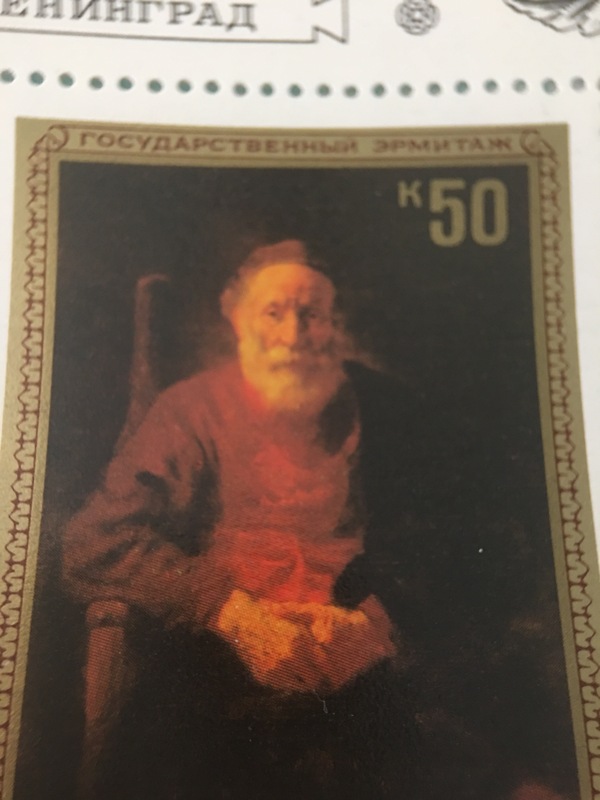 Rembrandt’s work is often featured in commemoration on Soviet postage. Why? Was he Russian? No, he was Dutch, and they so much as tell you so on this plate. The reason for so much Rembrandt is told to you on this plate as well, in short. Catherine the Great purchased a good few of them–twenty-three actually–and they live in the Hermitage museum to this day. 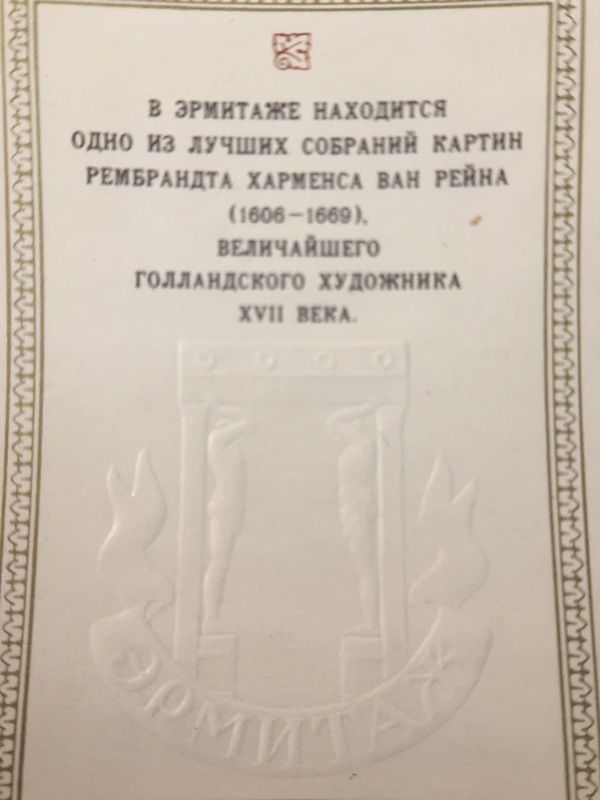 It was issued on 1983/11/10 (YMD) and comes individually numbered. 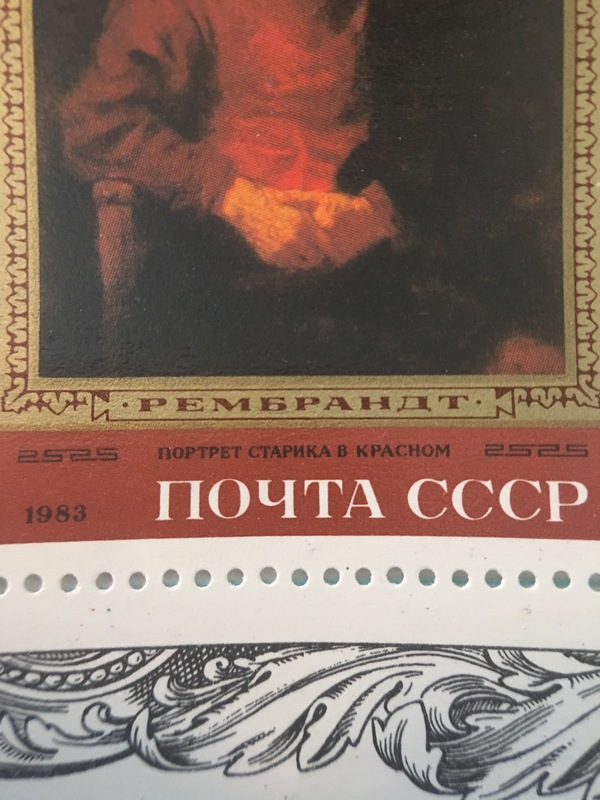 The top of the plate reads “State Hermitage Musuem: Leningrad.” The top of the stamps also says “State Hermitage.” The bottom of the gold border on the stamp says Rembrandt, and the tiny print below that is the name of the actual piece. The middle of the plate reads (roughly) “An assembly paintings situated in The Hermitage by Rembrandt, 1606-1669, the greatest Dutch artist of the 17th Century.” Below this is the seal of The Hermitage. The Hermitage actually has a Rembrandt room for all of these pieces. I suppose it is worth noting the city is no longer called Leningrad, today it is Saint Petersburg. Next, is the 60th Anniversary of Aeroflot. Instituted in 1923, Aeroflot was the state airline of the Soviet Union, and today is the flag carrier of the Russian Federation and their largest airline. The airliner featured is an Ilyushin-86, introduced in 1980 and retired from civilian service in 2011. The Russian Air Force may still use a couple. There were 106 of them produced and they were the first Soviet wide body, and the second four engine wide body in the world. The plane was reliable, but the engines, in true Soviet fashion, came off the assembly line outdated by twenty years when they were new. Still this model never saw a fatal incident. Now, let’s get into the really good stuff! This kind of thing is in now way special. 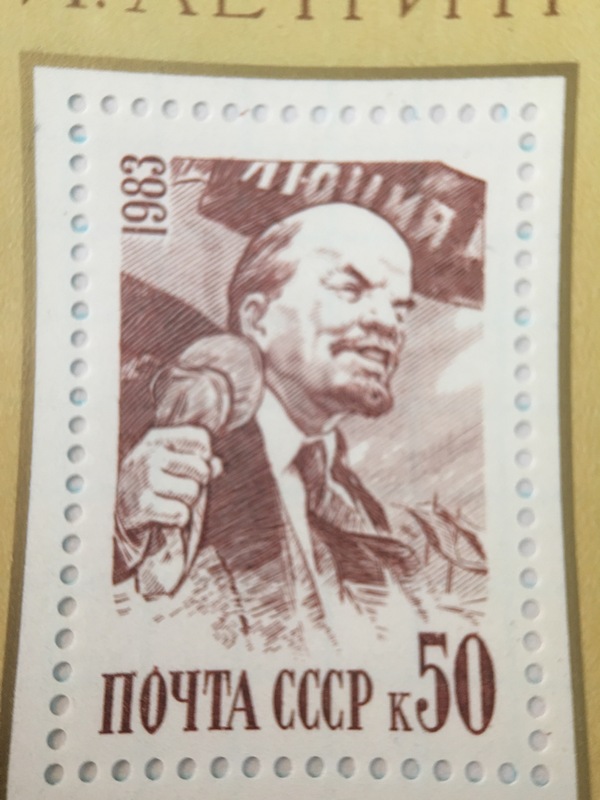 I have seen all the years, but it is not far fetched to think that the only years there were not stamps celebrating his birth were 1922-24, the years he was alive and that they had stamps, and the year he died. However, what makes this one interesting, in my opinion, is the sketch on the bottom right of the plate. It has Trotsky. Trotsky! Trotsky was a no-go. Stalin hated this guy, had him assassinated even. Animal Farm tells the tale. There were even some assassinations arranged in house of people falling out of favor, and their murders were blamed on others as being members of supposed “Trotskyist Plots” against the state. This was the start of the purges! 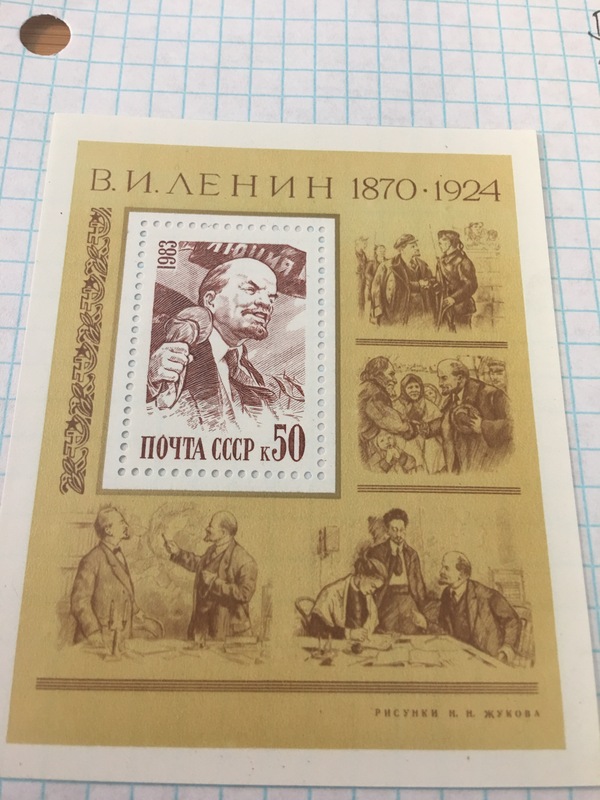 Color me red with surprise at finding Trotsky on a Lenin stamp less than thirty years after Khrushchev denounced the boss. 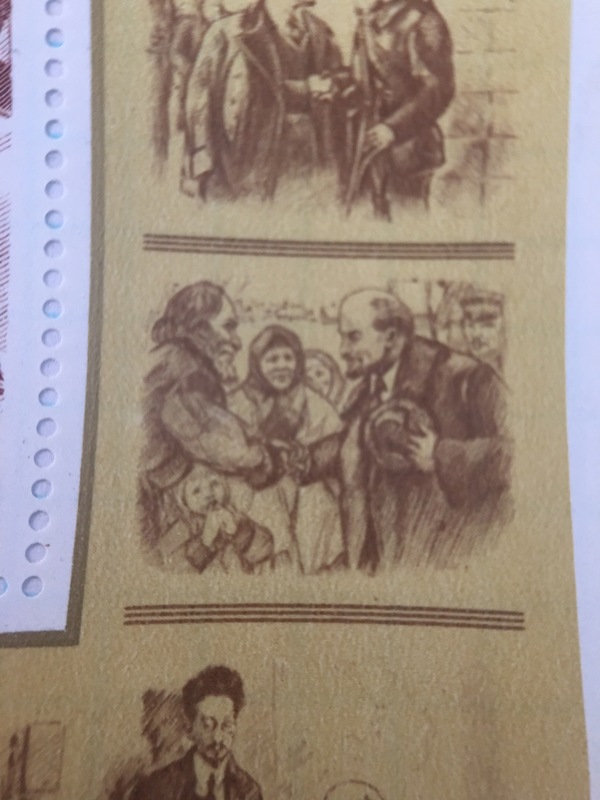 The Rest shows Lenin with peasants, and with a soldier. The bottom left sketch I am unsure about. The Stamp itself is not bad either. 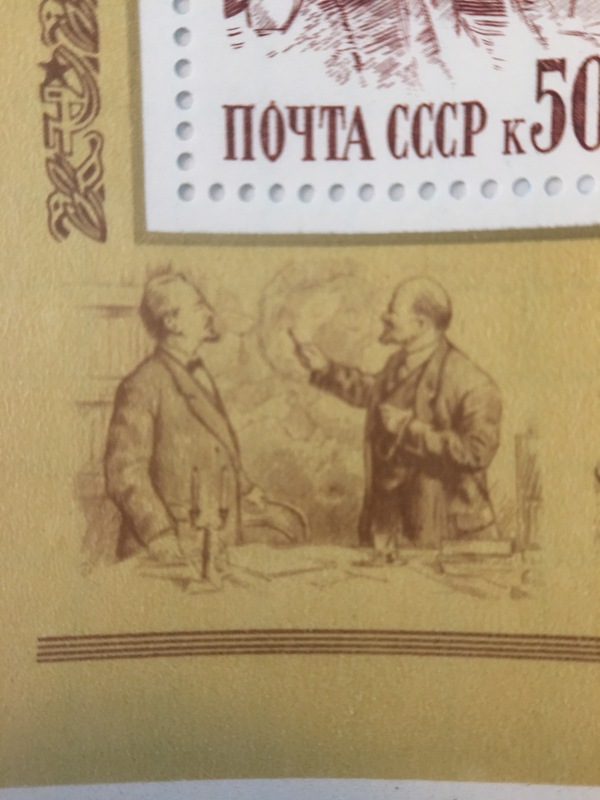 I feel it shows Lenin the revolutionary, speaking to a crowd. Note the banners on the top and bottom right, and Lenin’s cap crushed in his hand. Lastly, a stamp to commemorate World Communication Year. Aside from Leon making an appearance, this is my favorite of the day. In 1981 the U.N. decreed that 1983 was to be World Communications Year, a year to develop communication infrastructure. They were not simply talking about improving phone lines, what they were describing was globalization. Globalization was a term that came into use in the 70s, and is embodied, I feel, by the 1980s. World Communications Year was supposed to show that in this new age of technology and progress no person (in a U.N. member state) was not to be disconnected from his local, state, and global community. To me this is globalization. It calls forth images of movies like Jumping Jack Flash in which Whoopie Goldberg works on a computer in a bank, effecting transactions in seconds between far away nations. It is the sattelites in the sky, the computer, world news services, it is again, the bank seen in Ghost featuring ultra modern money laundering via the wire. It was the cell phone and finally some things that we today call collectively, the internet. 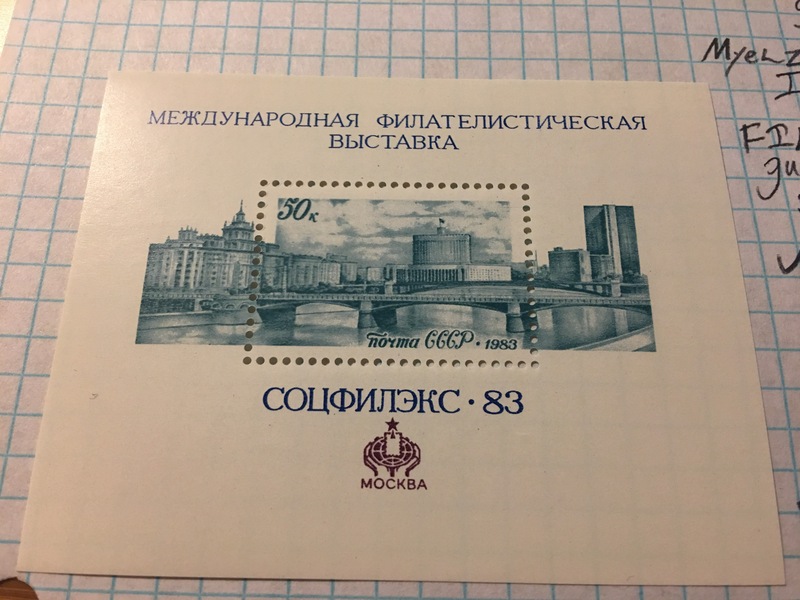 That’s what 1983 was supposed to be about, to me that was what the 80s represented, and it is what the symbols on this stamp show. I am not unsure what to make of the horn surrounding the globe in the image, and I do love how they highlighted their nation on the globe (The U.S. would have done the same.) 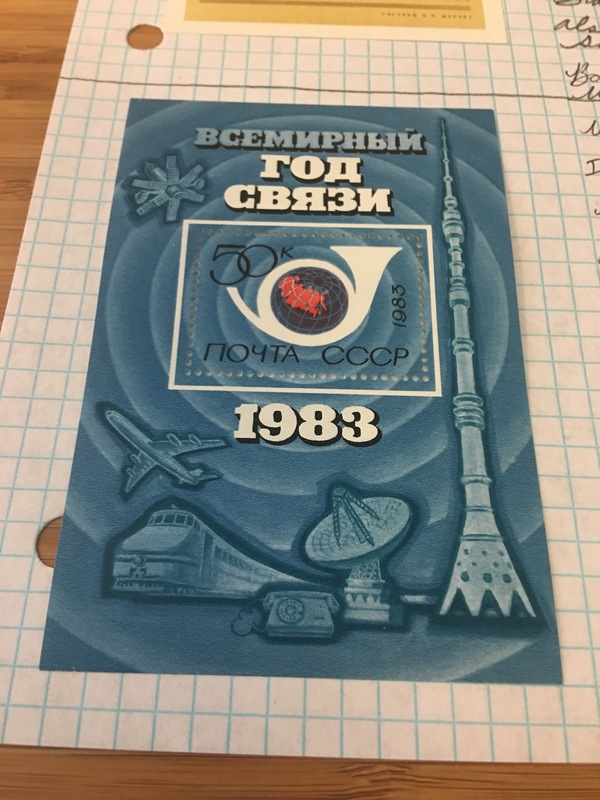 I feel the idea of this stamp, the year, globalization, a good bit of the Cold War, and the 80s can be summed up by the largest symbol on the stamp, the radio waves which emminate from the stamp and onto the plate. Go watch and 80s movie and hunt some themes. Better yet, do it while enjoying your stamps. For many analog hobbies, it is true that if you look near the heart of the thing, collecting can be found in some form or another. For me the love of the stamp came naturally, and was partially detailed in a previous post, but here is the short version. My Grandmother was a Rural Letter Carrier. My mother worked there off and on, My grandfather also worked there, and later my grandparents would retire from that post office. It is/was one of my favorite places in the world, it is the post office for home, Soddy Daisy Tennessee. I used to play out in the parking lot, and there was a wall to keep the ground from collapsing into the lot. If you climbed to the top of it there were railroad tracks, it was at this rural post office, as a boy, that I saw the tan tanks on trains heading off somewhere in the early 90s. Stamp collecting goes back to the advent of well…the postage stamp. I love history, and if you look closely enough, there is a history lesson in every postage stamp. What makes it great as an analog hobby besides that? Well, it does not require a lot of start-up capital or specialized equipment or the thing we all seem to be short on, time. It can be as simple as buying a sheet of stamps that you like at the post office and putting it away. Places like Hobby Lobby sell bags of around 300 stamps for about ten dollars a bag, and there is a big mash up of stamps in those. You will, of course, come across many repeats, but there are great things too, I have pulled plenty of WWII war bond stamps out of those bags. 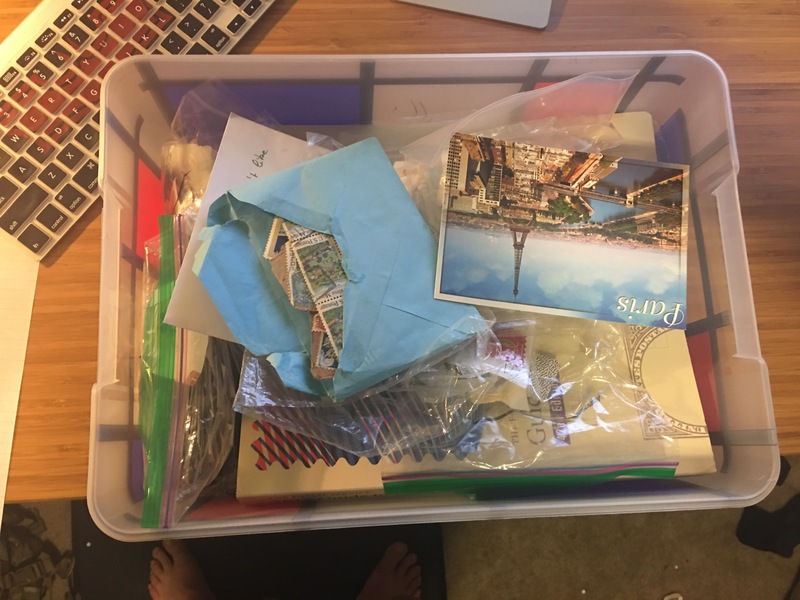 I collected ever since I was a child, and it usually consisted of putting away sheets of the stamps that had come out and my family bought me what they believed I would like. Remember for me, the post office was a deep part of life. I looked forward to the post office picnic every year. There were good prizes for the games, usually postal related. The point is, I was never one to trace rare stamps, or to have a giant book, but what I did have was Classic Movie Monsters, Bugs Bunny, and I Love Lucy. This hobby allows you to pick your own involvement level. Minimal investment, a vague interest, and the willingness to research. Here is where I will say this for the first time: Digital for the win. This hobby has been improved through the wonders of the Internet and the personal computer. Guides, and lists, that used to cost money, are now available for free online. 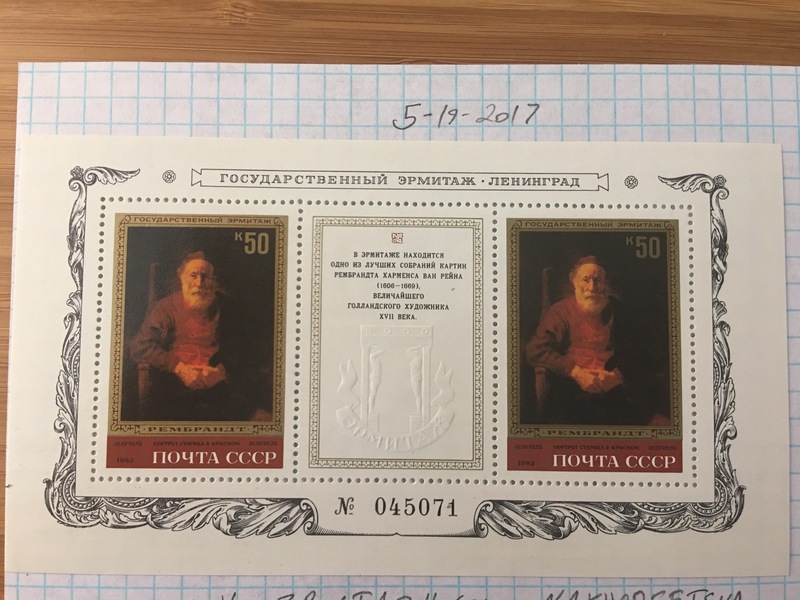 My real collection is the stamps of The Soviet Union, and a website called Collectors Net has saved me the price of a sixty dollar book. You will all have to forgive me from this point on with this post, I was just informed that I lost a family member tonight. I decided to involve my son in stamp collecting and so we expanded a bit. We buy the bags together, sort the stamps together, and then we do his favorite part, we soak the stamps in hot water and peel them from the paper they are stuck to and dry them in books. It is time together, not in front of a screen (minus part of the research, if we do not use the hard copy encyclopedias) and he gets to learn some things. 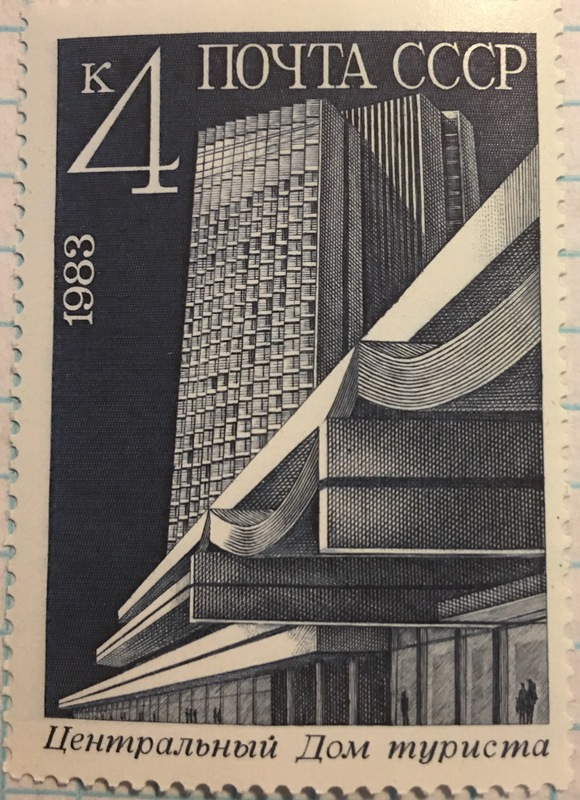 Stamps do not offer much in the way of the tactile, but even at four, the taste he had gotten was enough to make him excited to see the National Postal Museum in Washington D.C. and as I said, it does not involve a video game or a television. It steps into the real a little bit. Bottom line- You can start a quick and easy collection that can grow with your knowledge on the subject. You can give the collection and the passion to your kids. You will also be in some good company, FDR and Freddy Mercury counted among the great philatelist. Let’s address that, philately, the study of stamps, is not stamp collecting. However, you usually cannot collect stamps without some light philately, so do not get hung up on the two being used interchangeably. something for everyone-national icons, celebrities, sports, the stamp world almost has it’s own rule 34. The National Postal Museum has better articles than I could ever write on how to get started, right here. Getting a pen pal or two can help, they usually have cool foreign stamps if they are not from U.S.
Get out there and get an old fashioned stamp, and look at it. If you are still collecting in a year, maybe you will be ready to study how they are printed.